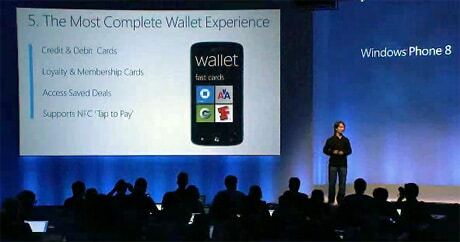 The launch presentation for Windows Phone 8 shows how Microsoft plans to make its NFC mobile wallet more widely accepted than Google’s, provides details of a forthcoming NFC-enabled Chase payments app and highlights a new deals platform and in-app purchasing technology that charges items to the user’s default payment card. Full video coverage of the launch of Windows Phone 8, during which Microsoft unveiled support for both NFC and a mobile wallet in the new version of its mobile operating system, is now available to view on Microsoft’s Channel 9 website. NFC is first introduced during the presentation by Joe Belfiore, Microsoft’s corporate vice president of Windows Phone, at 19:28 into the video. Belfiore explains that Windows Phone 8 will come with support for native NFC and that this support isn’t limited to phones but will also cover interactions between phones, laptops and PCs. Microsoft announced in September 2011 that Windows 8 includes support for NFC. “We’ve seen Google with their wallet enable secure NFC payments by putting the secure element in the device and an unfortunate side effect for that has been that some mobile operators have chosen to remove the Google Wallet because the mobile operators themselves want to provision those secure elements and enable their customers to maintain their secure payment instruments as they move from one phone to the next. Belfiore then returns to NFC at 48:07 in the video to demonstrate how the technology can be used to “tap and send” data from a Windows phone in peer-to-peer mode to another NFC-enabled Windows device. Belfiore then goes on to explain the Windows Phone 8 mobile wallet’s deals capability in more detail, using the search for a good place to sit down and read a book borrowed from a library service as an example. From within a San Francisco library app, which also includes a virtual version of a barcode-based library card, users will be able to directly access a mapping service that displays local services and a list of deals available from local merchants. They can then click on a particular merchant’s deal to view their “Place Card” and then click on an offer to collect the deal and save it to their wallet, share it with other people or pin the deal to their start menu. Saved deals can then be redeemed at the merchant via NFC, barcode scanning or other means. The wallet can be secured by the user via a PIN and, as well as real world purchases, the new mobile wallet can also be used for mcommerce, app store and in-app purchasing, Belfiore adds. Here, items can be charged to the user’s choice of payment mechanism. Finally, at 01:03:00 in the presentation, a video shows how the various functions within the wallet can be combined in scenario featuring a family going out to lunch at a cafe. The family first purchases a Groupon deal for a cafe on their phone, using the in-app purchasing platform — whilst standing outside the cafe. On entry, their phone is tapped to the cafe’s NFC-enabled Windows 8 tablet to share contact information. They are then able to place their order from a comfortable seating area using the cafe’s mobile menu and settle their bill at the end by tapping their NFC phone to the cafe’s NFC tablet to redeem their Groupon coupon.